China Tech & Alibaba were up +6.28% and +5.87% after good U.S.-China trade fight news, but there’s bad news too. We want to prepare you, so keep reading. Good news on the China-U.S. trade fight boosted returns of China stocks, many of which, including Alibaba, are in the CQQQ ETF. Hence this week’s strong performance. In the last ~2 months since the year 2019 began, the CQQQ ETF is up a whopping +27.88% after a poor full-year 2018 performance, in which it dropped about the same, -26.72%. Why the reversal? There is a March 1 deadline at which point 10% tariffs on $200B of imports from China, which have already done some damage, would more than double, to 25%. Positive trade negotiation news means that maybe there will be a resolution favorable to both parties, whereas the increase to 25% on $200B of goods is expected to hurt both economies, but China much more than the U.S. The volatile video game stock was damaged again this week. In just the last month, the company released lower earnings than expected, and experienced a big sell-off in early February. Then it staged a huge +30% rally and was the best weekly performer on iBillionaire earlier this month after its video game Apex appeared to have the makings of a viral hit like the company’s Fortnite. Now, the Apex game is actually not looking like a hit, and the stock took a dive. The market is approaching the highs it reached in September, just two months after the three-month long -20% downturn. That’s the good news. The bad news is that many experts agree that the “cycle” of good returns we’ve been in since the recovery is coming to an end. Most economic indicators, which are signs that point to where we are in the cycle, are flashing signals that indeed, we are at or near the peak. The current expansion, as periods of time when GDP growth is strong and market prices go up are called, is already quite long as expansions go: 89 months. GDP growth in Q2 2018 was over 4%, and there are no expectations that it will return to that level any time soon. Q4 2018 growth is expected to be about 2%, and Q1 under 2%. More recent data that point to a cycle top are listed below in the “Other important news” section. When will it come? Ray Dalio says 2020. No one can be sure. But at some point, it always comes, and the market has been so good for so long, that chances are it’s coming sometime in the next few years. Don’t sell now OR panic sell. If you have an emergency fund, it will enable you to stay invested, and take advantage of the opportunity to grow your wealth during the downturn and the recovery. You won’t need to sell at a loss in the event of a layoff or other emergency. If you don’t have an emergency fund, get one yesterday! A downturn can be an incredible opportunity to grow your wealth. Don’t squander it by panic selling and then being fearful of the market. Downturns benefit people who are invested in the long-term. For those that aren’t, the wealth gap widens. Read more about why a downturn is coming and what to do about it (and why downturns benefit investors and not non-investors) on our blog. 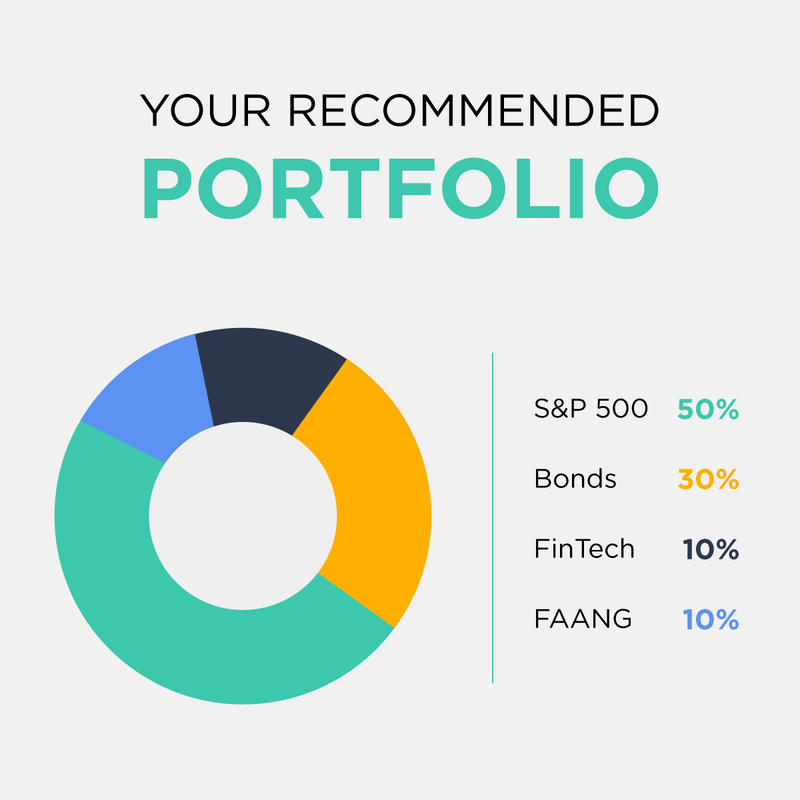 Your recommended portfolio will show an appropriate mix based on your age, risk tolerance, investment goals, and experience. It’s a good guideline to work off of at the very least. This week, the S&P 500 SPY ETF was up a healthy +0.65%. The bump came from the Federal Reserve’s news that it would end its balance sheet reduction in both the near-term and long-term. Also, more positive China trade talk news, which usually has an upwards effect on the market. The Dow Jones Industrial Average and NASDAQ Composite were also up healthy amount: +0.57% & +0.74%, respectively. The Dow Jones, in fact, is on course for 9 straight weeks of positive gains, a record that hasn’t been touched since 1995. Meanwhile, bonds (BND ETF) were about flat, returning +0.08%, but gold (GLD ETF) had a decent week, +0.57%. Gold has had a solid start to the year, up +3.5% YTD. Buffett’s Berkshire Hathaway earnings forecast cut in half after one of his largest investments, Kraft-Heinz, revealed a huge write down, an SEC probe, and a poor outlook. Important Note: The above performance is as of February 22, 2018. Past performance does not indicate future performance. The information included in this publication is for educational purposes only. iBillionaire gathers its data from sources it considers reliable. However, iBillionaire does not guarantee the accuracy or completeness of the information provided in this publication. The opinions presented reflect the current judgment of the authors and are subject to change. iBillionaire makes no warranties, express or implied, regarding the accuracy of this information or the subjective opinions expressed by the authors. Officers, directors, employees and affiliates may have positions in the securities of companies discussed. The data included in this publication cannot and is not intended to, in and of itself, be used to determine which securities to buy or sell, or when to buy or sell any security or investment, or represent directly or indirectly, that any graph, chart, formula or other device being offered will assist any person in making his own decisions as to which securities to buy, sell, or when to buy or sell them. All investors should consider the limitations of the information provided and the difficulties with respect to its application to any investing activity.